The infrared process uses an infrared heating unit to heat in-place asphalt to soften it to a workable state, then new asphalt can be added which fuses seamlessly to the old. 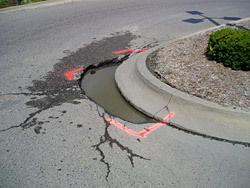 The most popular example of the technology is in pothole repair. 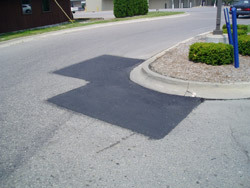 As compared to the old saw cut method, where a square of damaged asphalt is cut out, removed and filled with new, the infrared method eliminates the seams that quickly ruin such patches. Thus, the big advantage is the feathered joining of the new patch material to the surrounding pavement – no seams, no water infiltration. Saw cut seams permit rainfall to enter, which quickly introduces moisture and freeze/thaw damage into the patch. Many such patches have to be redone every year. • Sweep and dry the area. • Position the infrared heating array over the pothole for seven to 10 minutes. 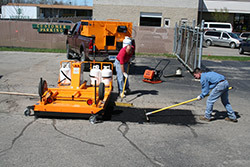 • Remove the heater and rake the softened (350 degree) asphalt. • Mix in a rejuvenator to replenish light oils that have oxidized away. • Add a small amount of fresh asphalt and grade it to level with a lute. • Use a vibratory roller to compact and fuse the patch with the surrounding pavement. • Patched area is ready for traffic within 20 minutes or so (depending on size). The time for using old, cheap methods that fail every year is past. It is no longer acceptable to the driving public, or to transportation authorities to use flimsy repairs, ignoring things like asset management, sustainability, carbon emissions, noise pollution, recycling potential, highway safety or employee safety. Infrared addresses all these issues and others, like quality assurance and even attractive results. The process recycles the asphalt in place. In a small, unscientific random sampling of specification sheets for various departments of transportation, only a tiny percentage mention infrared jobs, and many don’t appear to use it at all. Probably the most exciting uses of the infrared process are found in asphalt stamping and patterned surfaces, as well as the application of thermoplastics for decorative projects. There is no question that this market segment is on the move, making it ideal for the small contractor. Photographs were kindly submitted by Cliff Cameron of KM International. You can visit their website at www.kminb.com.